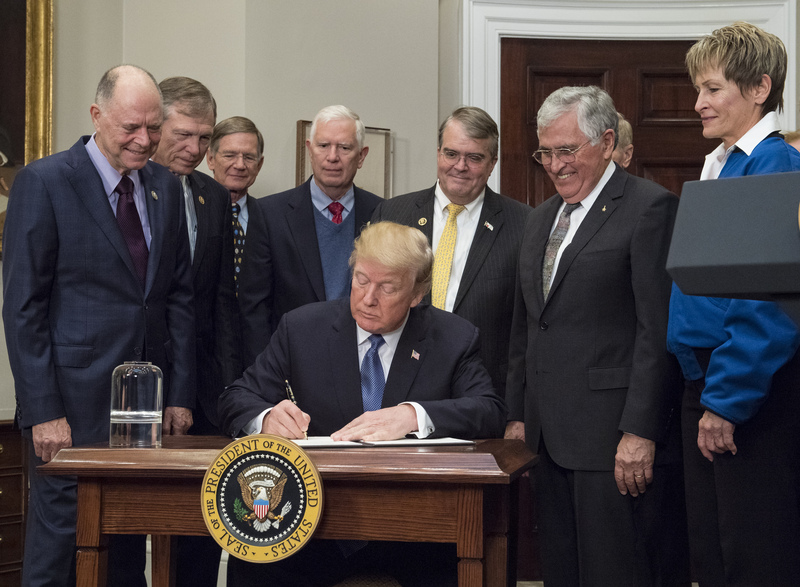 US President Donald Trump signed a directive on December 11 that instructs NASA to send astronauts back to the Moon. The order comes with no specific time frame and, as yet, no funding. But the Trump administration had been signalling its interest in returning humans to the Moon's surface, raising lunar scientists' hopes for a formal change in policy. “This is huge,” says David Kring, a geologist at the Lunar and Planetary Institute in Houston, Texas, who has worked in recent years on possible lunar landing sites for astronauts. Unlike the Apollo missions of the 1960s and 1970s, NASA's new lunar push is expected to involve international collaboration. “The United States will work with other nations and private industry to return astronauts to the Moon, developing the technology and means for manned exploration of Mars and other destinations in the Solar System,” the White House said in a statement. Former President Barack Obama’s space policy had directed NASA to send astronauts to an asteroid as an interim step on the way to Mars. Several commercial companies are likely to benefit from the new push, including Moon Express of Cape Canaveral, Florida, and Astrobotic of Pittsburgh, Pennsylvania. Both are developing lunar landers. The space agencies of 14 nations have been drawing up details on how crewed missions to the lunar surface might unfold. The International Space Exploration Coordination Group envisages five visits, each involving four astronauts, to five different landing sites over the course of five years. On each visit the astronauts would spend up to 28 days on the lunar surface, driving a rover around to explore each region. After the crew for a mission left, NASA mission controllers would remotely drive the rover to the next expected landing site. Along the way it could collect scientific data on phenomena such as water ice in craters. According to a scenario published by the working group in 2015, the first landing site would be Malapert Massif, a mountain near the lunar south pole, followed by a high ridge closer to the pole. Next would come Schrödinger crater, which shows signs of recent volcanic activity, and the Antoniadi crater. The final stop would be a site within the South Pole–Aitken basin—the biggest and oldest impact crater on the Moon, which exposes the lunar interior. NASA is already developing a heavy-lift rocket and crew vehicle that could carry astronauts to the Moon. They would be ready no earlier than the early 2020s. The most significant piece of hardware the agency would have to develop to put astronauts on the lunar surface would be a lander. Trump’s nominee to lead NASA, Oklahoma Congressman Jim Bridenstine, has not yet been confirmed by the US Senate. This article is reproduced with permission and was first published on December 11, 2017.